Recently, UKIP seem to have become an inescapable feature of British politics. There has been a surge in interest and support for the party, largely due to the fact they are commonly described as being ‘anti-politics’. Protest parties are nothing new, but currently the level of support for parties on the fringes of mainstream politics seems to be soaring. This isn’t just a British trend. All over Europe, minor parties are receiving backing – and votes – in unprecedented numbers, from those pissed off with the current political and economic norm. The parties on the rise range from Italy’s ‘Five Star Movement’, an anti-sleaze and corruption party led by a former comedian, to Greece’s ‘Golden Dawn’, a self confessed racist party largely believed to be behind a rise in racist attacks. One thing lacking from this new makeup of European politics is the far left, notable by their absence. Two years ago, there was a brief flurry of left-wing activity, with the Left Front in France and United Left in Spain, doing better than expected in elections, although both finished a long way off from the leaders. This now seems all but over, as the latest cohort of populist parties sit firmly on the far right of the spectrum. It’s been five years since much of the Western World was thrown into recession, five years in which voters across the continent have watched the biggest political parties, with their well established theories, try and fail to fix their respective economies. Is it any surprise people are fed up and turning their backs on them? So, much of the success and increased numbers of these fringe parties can be attributed to a widespread disaffection with mainstream politics and a belief that major parties are forming a cosy consensus of the political elite – or ‘three cheeks of the same arse’ as ‘Gorgeous’ George Galloway would say (Christ, even he’s back in Parliament!). The drifting together of the mainstream parties has been caused by a now-established belief that the only way to win elections is to stick to the middle ground. This goes some way to explain why, rather than simply switching allegiances to the opposition, it seems many Europeans are increasingly backing the extreme parties on the fringes of the political spectrum. One common fixture of the ire of these disaffected voters and the parties they are now backing is a mistrust of the European Union, and a desire for a change in the way it’s run. In Britain, UKIP obviously pursue a withdrawal from the EU, or at the very least a referendum, whilst the ‘Five Star Movement’ in Italy seem fed up of the actions of the EU, in particular the appointment of a technocrat led Italian government, and are becoming increasingly euro-sceptic. Whether or not this reflects a change in opinions as a whole is debatable, although many people are quick to suggest that the popular view of the European Union is souring. If the increased influence of these largely anti-EU parties is based on a different attitude to Europe, it could go some way to explaining why the left (almost entirely pro-European) are trailing so far in their wake. Far more worrying than the increase in euro-scepticism is the rise of the European far right, with parties such as Golden Dawn making some of the biggest and most shocking gains in European elections. Golden Dawn hold 18 seats in the Greek parliament, while Hungary’s neo-Nazi ‘Jobbik’ party are currently the third largest in the National Assembly. The far right is even on the move in, relatively liberal, France, with the National Front’s leader, Marine Le Pen, coming third in the first round of last year’s presidential election. In recent weeks, the far right has reared its ugly head in Britain again, as the weekend racists of the ‘English Defence League’ have knocked back their cans of Stella, donned their best tracksuit and tried to cause some sort of racist anarchy on the streets of Britain. Other than the European Union, people have found relatively few obvious figures to blame; people are desperate for a scapegoat for their loss of work, savings and home. Those on the far right are offering them: immigrants and ethnic minorities. All sound a bit familiar? A pretty shocking moment in this growing anti-politics trend was the now infamous incident when Greek fascist, and Golden Dawn MP, Ilias Kasidiaris, slapped the Communist MP Liana Kanelli live on TV. Rather than this being seen as him hitting a woman (which, you know, it was!) this was seen as him trying to hurt the political elite that had broken Greece. Within hours there was a Facebook page of support for him and Golden Dawn’s poll ratings had gone up by 2%. Weird. Instead of representing the vile, racist and fascist views of his party, Kasidiaris and those like him are the thugs that have become the embodiment of the incoherent and blinding anger that the Greek people feel towards the political class. In Britain, the anger towards Cameron & Co. may not be quite as high as its Greek equivalent, but the rise of Nigel Farage as a bitter-drinking, cigarette-smoking political maverick is undeniable. Even the most hardened of UKIP haters can’t help but be slightly charmed by his honesty, as shown recently by his admissions of visiting strip clubs and swerving some of his MEP duties in favour of a pint. It is understandable that people see such an appeal in Farage as he shakes the typical straight-laced vision of a politician, and is more than happy to admit his own flaws and failings. The same can be said for Galloway, who’s stock appears to rising once again, albeit tentatively. Bored by years of dull, soulless, Blair-lite politicians, the electorate is crying out for charisma and personality, neither of which are offered by major parties nowadays. One of the common themes during the County Council elections earlier this year (and the Corby and South Shields byelections) was that people were voting for UKIP as a ‘none-of-the-above’ option. UKIP as a protest vote seems to be working, as the more mainstream parties are forced to listen. The Conservatives are now offering a referendum on Europe and Labour appears to be toughening its stance on immigration: the two headline UKIP policies. Other European countries aren’t so keen to welcome the new, populist ideas. 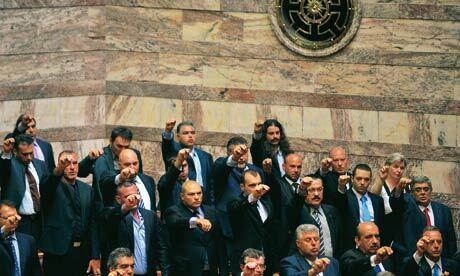 For all Golden Dawn’s seats in parliament, much of the establishment (politicians and journalists alike) are only just beginning to talk about them, having realised they won’t go away. There is no doubt that these right-wing parties are holding more influence than they have for generations. In the UK, although you may not agree with UKIP, this isn’t a problem. However, in countries such as Greece and Hungary, where Fascism is rearing its ugly head, they represent a challenge to the way of life. What isn’t clear is if they are simply a protest vote, who will be ignored come election time, or if they are a serious threat to humanitarianism. Shall we wait and see?